SteelSeries delivers a somewhat weird gaming peripheral; a handheld steering wheel without floor pedals. 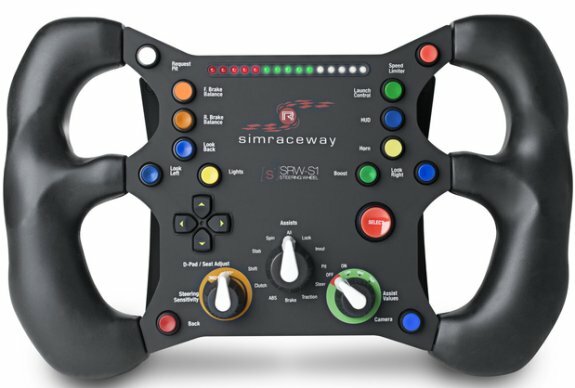 The Simraceway SRW-S1 is designed as an affordable, high-performance PC controller, it has a hand-controlled paddle system on the rear of the wheel and has over 20 on-wheel buttons and dials. SteelSeries, the leading manufacturer of premium-quality, competitive gaming peripherals and Ignite Game Technologies, creators of groundbreaking auto racing platform Simraceway®, today introduced the Simraceway® SRW-S1 Steering Wheel, an affordable, high-performance PC controller that aims to open up a whole new racing world to players frustrated by the limitations of joypads. A handheld hybrid racing controller that combines the features and functions of a high-end wheel with the portability and convenience of a joypad, the SRW-S1 includes a motion-sensor for steering and a patent-pending throttle and brake paddle system for a fully simulated driving experience without the need for floor pedals. Designed, tested and approved by a team of champion drivers, including four-time IndyCar Series winner Dario Franchitti, double Indy 500 Champion, the late, great and much missed, Dan Wheldon, and SimRacing stars David Greco and Bruno Marques, the new wheel brings racing game players complete customizability and original features that will enhance their PC racing experience. “When we set out in 2008 to create a new kind of racing game, one of the first issues we had to confront was the age-old ‘interface problem’,” said Ignite CEO Jonathan Haswell. “For decades now, racing game players have been faced with the unenviable choice of spending a huge amount of money on a wheel-and-pedal set that is tricky to set up, store and transport or settling for a binary joypad that simply isn’t fit-for-purpose. Unique hybrid design brings a true-to-life racing experience to your laptop or desktop computer without the set-up, storage or transportation hassles of a wheel-and-pedal set. A patent-pending, hand-controlled paddle system on the rear of the wheel produces full-range acceleration and braking, providing drivers with the same subtlety of control as high-end wheel sets and real-world cars. Over 20 on-wheel buttons and dials, each one optimized for easy access, and two ergonomically-designed rubberized grips ensure drivers stay in complete control. No complicated configuration required when used with Simraceway. No device drivers to load, no bamboozling set-up process to follow—simply plug-and-race. Can be used with most PC racing games although some features, including the Assists dials and the shift indicator LEDs, may not be compatible with certain titles. Many of the SRW-S1 Steering Wheel’s controls can be customized to suit the driving and gaming preferences of individual players. Find out more about the simulated racing experience at http://simraceway.com. The Simraceway SRW-S1 Steering Wheel is available now online in the SteelSeries Web Shop for $119.99 / €119.99 MSRP.